This White Rim Trail & Cataract Canyon stargazing trip is the best way to explore Canyonlands National Park, recently certified as a “Dark Sky Park” by the International Dark Sky Association. Spend the first few days of your vacation pedaling through some of the most breathtaking overlooks and view-scapes in the west on the bike-tour; then at night explore the Milky Way, the Andromeda Galaxy, and watch satellites and meteors light up the night. and learn constellations. With both binoculars and naked eyes we can open our imaginations up to the stars. Then mid-way through your back country getaway, hop off the saddle and into a raft to peer up at these magnificent canyon walls, now from inside the heart of the Park, in Cataract Canyon. The stars take on a whole new perspective, now cradled between two canyon walls. Enjoy folklore about the constellations and deeper your understanding of the night sky with a star guide from Clark Planetarium as well as Holiday's expert interpretive guide team. ***The Bicycling: The White Rim bike route is a technically challenging route. This undeveloped dirt road has steep downhills, loose rocks, sand, and ruts. Riders who have no off-road bicycling experience, or who are not athletic will most likely find this trip too challenging. All riders should prepare for the trip by riding their bike on a regular basis prior to the trip. The White Rim Trail carves its route around the ‘island in the sky’ between the Green and Colorado Rivers. This trip will start on the Green River side of the drainage and meander through Stillwater canyon to converge at the confluence of the mighty Colorado. Cataract Canyon runs through the heart of Canyonlands National Park. After all the rapids you can handle the river enters Glen Canyon National Rec. area where we take out below the confluence of the Dirty Devil. One of the advantages of a bike/river trip is the flexibility of the daily itinerary. It can vary widely from one trip to the next based on group desires, Mother Nature, and courtesy for other groups in the area. 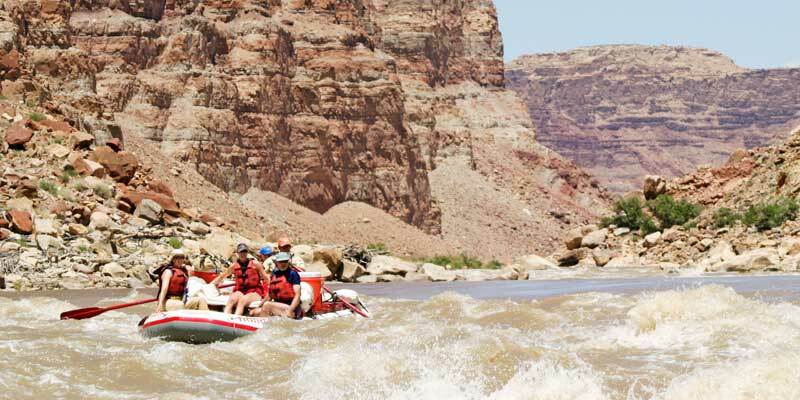 This typical itinerary illustrates a bike trip through the Island in the Sky District and raft trip through Cataract Canyon using the Green River's Labyrinth and Stillwater canyons. Because of changes in the river's speed the White Rim/Cataract trip varies slightly with the time of season that you go. The May trips usually meet up with the rafts in mid to late afternoon of the third day out. The September trips will meet up with the rafts prior to lunch on the third day. Day 1: Meet group at headquarters in Green River, Utah at 7:00 a.m. Before leaving our headquarters, each guest along with a Holiday guide will perform a pre-trip inspection of your bikes. If you are providing your own bike, please make sure that it is in good repair, we recommend a complete service by a professional shop prior to the trip. Guests with bikes’ that fail our inspection will be asked to rent a Holiday bike for $170.00/person. A two-hour van ride to the head of the Shafer Trail marks the start of the trip. The first day's ride will take the group down the switchbacks of the Shafer trail before cutting back south toward Musselman Arch. The trail continues to wind southward as it follows the meandering course of the Colorado River. Camp on this evening is made at or near Gooseberry Canyon. Day 2: Our ride will take us over undulating roads past the white, sandstone-capped monoliths of Monument and Twin basins. Then in the afternoon up to Murphy's Hogback, one of this trip’s challenging uphill stretches. After conquering the hill we will set camp for the night. Day 3: By the morning of this day the trail has turned back north and is following the contours of the Green River. We ride around the labyrinths of Soda Springs Basin and by Candlestick Tower before reaching where the rafts are waiting at Labyrinth or Taylor Canyon (May), and Beaver Bottom (September). Day 4: The River’s smooth current transports our rafts to stops at Valentine Bottom or Turks Head where we will observe prehistoric Indian ruins & petroglyphs. Quiet beaches, hidden canyons, and refreshing water fights are common throughout this section of the trip. Day 5: We reach the confluence of the Colorado and Green Rivers. The Ute Indians believe the Confluence to be the center of the universe. Just below the meeting of these two rivers enjoy a view of the Doll House, an appropriately named collection of freestanding, sandstone columns. Day 6: Possible early morning hike into Dollhouse. Ascend steeply to the canyon rim in the Maze District with red rock formations. After descending to the river, the rapids of Cataract Canyon await. The climax: Big Drop Rapids with Little Niagara and Satan's Gut. Day 7: Begin the journey through majestic Glen Canyon and the former high-water mark for “Lake” Powell. Aided by motorboat “Hayduke” during higher lake levels, you’ll finish the trip at Hite Take-out. A two-hour drive brings you back to Green River. We will disembark at Hite, Utah. Our expected time of arrival back at our headquarters is 5:00 to 6:00 p.m.
As mentioned earlier, this is a sample itinerary and should not be thought of as the trip you will experience. It is intended to give an idea of what the trip will be like. It could also be exactly what you do. Keep an open mind, be flexible, go with the flow, and enjoy! Colin, Brian and Sam were incredible! My wife was very nervous for the trip and now she wants to go again. In forty years together, this trip rates as one of the best we've ever taken. I highly recommend it to anyone that even gives a moment’s thought to a river trip. We hope to be back again next year.